The tools are Talking, Listening, Influencing, Connecting, Teaching, Encouraging, Correcting and Leading. I just started reading this book and am learning so much from it so far. Each chapter is only a few pages long and ends with a practical tip and a follow-up thought or action to consider. This is a great book for both moms and dads, single parents, Grandparents, aunts, uncles and other caregivers. At the end, there is a Summary of Tips section that lists all of the tips from each Tool and a Notes section where you can find the verses and other resources that the author references throughout the book. The 8simpletools.com website is packed full of information. They also have two assessments that you can take, the Effective Parenting Assessment (how effective is your parenting?) and the Parenting Strengths Assessment (what are your parenting strengths?) After taking the Effective Parenting Assessment, it gave me two action steps to help me create a stronger sense of family connection. The assessments are fast and easy to take. Receive 50% off the retail price of 8 Simple Tools from Moody Publishers with Discount Code – GREATKIDS16. This discount code is valid through May 15, 2016. Plus, for a limited time with every purchase, receive access to download the Hearts At Home “Essential Workshop Collection For Parents” for free. To receive access to the free downloads, fill out the form on this page. Thanks to FlyBy for including me on this promotion! I’m thrilled with this opportunity to introduce this book to you. After having our two kids, Easter took on a whole other meaning. It was no longer just about Palm Sunday, Maundy Thursday, Good Friday, and heading to church on Easter Sunday, bright and early with hearts full of praise that Jesus Christ had risen! After our children were born, my thoughts about Easter were consumed with finding the perfect Community Egg Hunt to take my children to or planning one of our own in the backyard, filling baskets with treats, chocolate bunnies and dyeing hard-boiled eggs. With the busyness of making Easter fun for the kids, taking time to reflect on what the season is really about is important and good for the soul. Easter Stories is a wonderful collection of 26 short stories that helps me focus on the true meaning of Easter. I haven’t read the entire book yet, but it’s been good reading a story whenever I can. Easter Stories will be treasured on my bookshelf for many years. You will also have the opportunity to win a copy of this book by entering the giveaway below. About the Book: Everyone who believes Easter is about more than Easter egg hunts will be grateful for this new anthology of short stories that illumine the true meaning of the season. 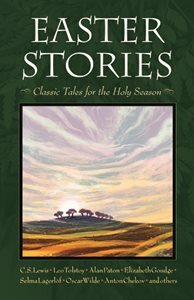 Selected for their spiritual value and literary quality, these classic tales capture the spirit of Holy Week and Easter in a way that will captivate readers of all ages. Parents and grandparents will find that children love to hear these stories read aloud, year after year. GIVEAWAY TIME!!! – One lucky reader will receive a copy of Easter Stories. Giveaway ends on Tuesday, March 31st at 11pm PST. To enter, leave a comment about your favorite Easter tradition or memory.